I don't expect The Greatest Hero I've Ever Heard Of to show up in any comics this week, but that doesn't mean he won't. 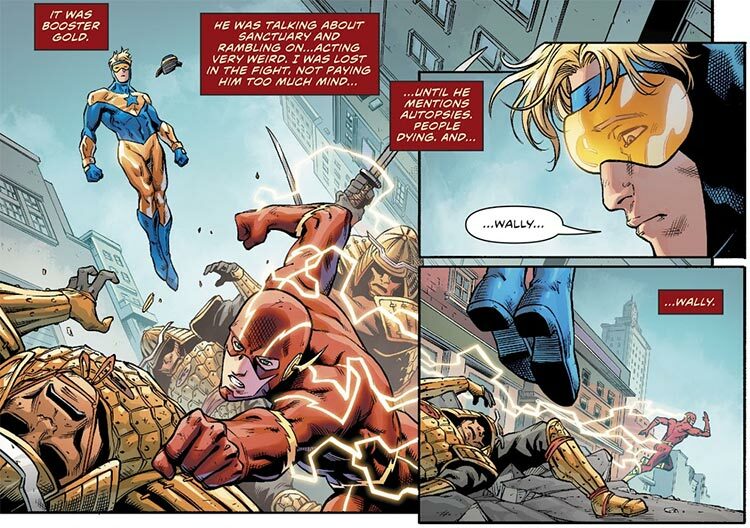 Thankfully, Booster Gold has great fans who catch many things that I miss. For example, Shawn Baston, a Booster booster from way back, writes to tell me that I missed this Booster Gold appearance in last week's The Flash #63. Also, Kevin Munson writes to tell me that the Boosterrific.com database was missing Booster's appearance in Justice League: 100 Greatest Moments: Highlights from the History of the World's Greatest Superheroes by Robert Greenberger. Published last year, this is the book is a retrospective of Justice League history, and no history of the Justice League would be complete without a recap of the Justice League International years. It is now included under the site's non-comics list of Other Media featuring Booster Gold. Thanks to Shawn and Kevin. Keep up the good work, everybody. If you see Booster Gold somewhere and you don't think I noticed, please drop me a line either in the news comments or via the Boosterrific.com Contact Form. If there were nine villains, and Booster Gold defeated seven of them, how many villains remain?